Busy home cooks know the many delicious meals that can be conjured up in a crockpot. Adept at making everything from soups and stews to full roasts to even desserts, a slow cooker in no doubt one of the kitchen's handiest appliances. 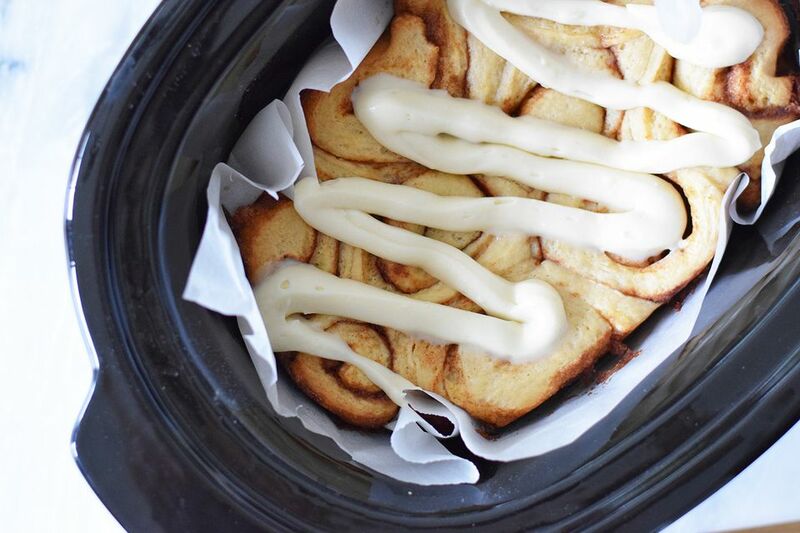 You can now add warm, gooey cinnamon rolls to that list. With no need to turn on an oven, this recipe is perfect for those summer months when you don't want to heat up the kitchen, or the night before Christmas when you need to quickly assemble breakfast for a crowd. Store the prepared dough inside the crockpot insert and pop into the fridge—when you wake up on Christmas morning, turn on the slow cooker and you'll have delicious rolls ready by the time everyone's ready to unwrap gifts. Heat the milk until it is hot, then cool it to lukewarm. Do not let the milk boil and do not add the yeast if the milk is still hot—make sure to wait until it has cooled a bit. If you add the yeast when the milk is too hot, it can kill the yeast and prevent the rolls from rising. Add the yeast to the lukewarm milk, gently stir, and allow it to sit for 5 minutes or until it starts to froth. Add the milk mixture, sugar, butter, and salt to the bowl of a stand mixer. Mix gently, using a paddle attachment, until incorporated. Slowly add in the beaten eggs. Change the attachment to a dough hook and gradually add the flour to the mixture. Knead the dough with the dough hook until it's smooth and has formed a soft ball. Add more flour if it's too sticky. Cover the bowl with a clean dish towel and allow the dough to rise in a warm place for about one hour. It should double in size during this time. Use a large enough piece of parchment paper to line the bottom and a few inches of the sides of your slow cooker. Once the dough has risen, knead it gently with your hands. Roll out the dough on a lightly floured surface with a rolling pin into a large rectangle, about 16-by-12 inches wide and a 1/4- inch thick. Spread the softened butter over the rectangle of dough. Sprinkle the brown sugar and cinnamon mixture evenly over the softened butter. Roll the dough over the sugar and continue to roll until you have a cylinder. Pinch the edge of the dough together, then cut into 1 1/2-inch slices. Place the slices into the lined slow cooker and top with a paper towel. This will absorb any condensation that will form on the lid and prevent it from dripping onto the rolls. Cook on high for 1 1/2 to 2 hours. Check the rolls after 1 1/2 hours and if they still look too doughy, continue cooking for another 10 to 30 minutes. Replace the paper towel if it is completely soaked. While the rolls are heating, beat together the ingredients for the icing in a medium-sized bowl until completely combined using a whisk or a hand-mixer. Lift the rolls out of the slow cooker by the edges of the parchment paper and place on a tray or serving platter. Once the rolls have cooled slightly slather the with the icing and serve!